This first card was made using the Three Wishes set. I adore these darling genies~they are just too fun! I stamped the palace onto some dp from the Basic Gray Eva paper pad and cut it out with Labels Two Nestabilities. I stamped each genie, colored them in with Copics, cut them out, and popped them up on Dimensionals. I added Stardust Stickles to the veil on the girl genie. I stamped the sentiment and punched it out with an oval punch. I sponged Ranger Antique Linen around the edges. I used my Fiskars border punch to create the decorative border and one of my Cuttlebug Vintage Dies for the corner embellishment. I added a straight stitch around the card and 3 black Kaiser pearls to the corner. 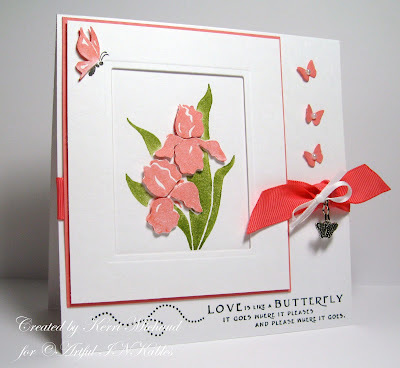 These next two card were made with the Bouquets & Butterflies set. Isn't this bouquet just beautiful! I adore it! Ok, I colored in the bouquet stamp directly with SU markers~Perfect Plum and Old Olive~gave it a huff and stamped it : ) I then colored in the flower portion again, stamped it, and cut the pieces out so I could pop them up with Dimensionals. I actually cut out one of the leaves too, so it wouldn't be cut off by the Oval Nestabilities : ) I stamped the butterfly with So Saffron twice, cut them out, layered them on top of each other, and added Kaiser pearls to the center along with some Stardust Stickles. I used my Scor-Pal for the lattice texture on the base of the card, and my Swiss Dots CB Folder for the dots on the white panel. For my final card, I colored the image with Cameo Coral and did the same as I did with the previous card. The butterfly in the corner was colored with Cameo Coral and a black marker, I stamped it in the corner, stamped it again, cut out the wing portion and popped that up on Dimensionals. I made the rectangle frame using my Rectangle Nestabilities. The small butterflies are a Martha Stewart Punch and I added a Kaiser pearl to the center of each. The adorable charm can also be found at Artful INKables, along with several other fantastic charms and ribbon! I hope you like my creations, and these awesome sets! Now onto how you can win these sets for yourself!!! Kristin is giving away all 4 sets to one lucky winner! All you have to do is leave a comment on this post, and I will randomly draw a winner next Wednesday the 22nd! Sound fabulous? Here is what you will win! Wow! I love all of the cards you created, Kerri! Love the scene you created on the first one! Love the dimension on the flowers with the second stamp set! Wow! They are so elegant!!! Kerri, your cards are all so very beautiful!!! Wow!! Love all of the designs, your layouts and excellent attention to details. Very well done, my friend! Super job with both sets - gorgeous color combo on the genie card! Kerri, I just love those irises!!! These cards are so stunning!!! Your cards are AWESOME!! What fun stamps to play with! Oh wow, you ladies are so inspiring and these stamps are all so lovely. This is what should happen every time there is a release in stamps. That way those of us can see how different people can come up with such lovely and different cards to make with those stamps. Keep up the phenomenal job! I LOOOOVVVEEE all three of your fabulous cards! The genie card shows the 3 main stamps off beauifully and your colors are wonderful. But I think I love the second 2 cards the best, the dimension you gave them makes those cards so elegant and lovely! I really enjoyed the blog hop today. Everyone did a fabulous jobs with their cards! *ACK* Kerri!! What fantabulous samples!! I love how you put the palace behind the genies! and your flower cards are to die for!! What a fun blog hop! Everyone had such fabulous cards - my favorites are with the Three Wishes and Greek Gardens! Thanks!! The samples are all so gorgeous! Such a wonderful group of talented ladies! I can't wait to get my order now! I especially love your flower cards! That is a very pretty stamp set. I had a fun time "hopping". Thanks for sharing your great cards! Kerri, all your cards are wonderful. The flowers are fabulous, and in such beautiful colors! Thanks for the opportunity to do some 'hopping'! Love your three cards! the iris ones are just stunning and the DP on the genie card is beautiful! what fun new stamps! Your cards are all stunning. I loved doing the blog hop and seeing what everyone has done with the new sets. Thanks to Kristen for offering the sets. Oh what fun they would be. Love the cards I've seen on the hop. They would make people really happy to receive one.I'd love to win the sets, so thanks for the chance! Great cards! :) What a fun blog hop too! Everyone is just so talented! Thanks for sharing! Great colors & design. I'm having fun! 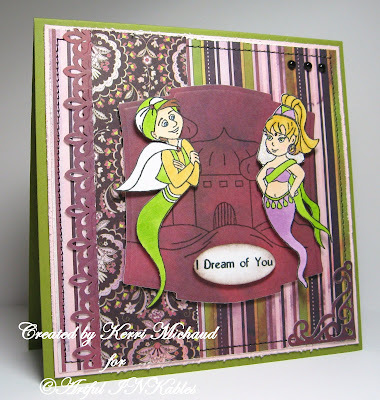 That I Dream of Jeannie - LOL - card is very different for you...maybe it's the strong colors or something...but I love that card....as a child of the 70s ;) I also like the scoring you did on the second one - I've never tried that and think it's a great addition. Really great cards, Kerri! Wow. The cards by all of the DT were just amazing. Thanks to all of you for the chance to win these awesome stamps sets! Wow! tHE CARDS ARE AMAZING AND i LOVE THE IMAGES! i SURE WOULD LOVE TO WIN THEM! Beautiful cards! I am ashamed to admit that I had not heard of Artful Inkables before. I am so happy to have found them. I just checked out the website and wow there are some fabulous stamps. Thanks so much and have a beautiful day. Love, love, love your Delight in Life card, and variations thereof. They are delightful!! Your layering and placing of embellishments is great. Thanks for the inspiration. I just ordered Verve verses today, thanks to your blog, and had not seen these before. OMWord!! All these stamp sets are just to cool. I would love to be the lucky stamper to play with all these. Your blog is fabulous and just love your creative and inspiring style of creating. Thanks so much for a chance. Oh, Kerri, I love your cards! They are all adorable. And the blog hop candy looks delicious! I enjoyed blog hopping and seeing all the fabulous creations by the DT. You guys rock! Hey Kerri, Glad your back! I love what you did with the Urban Garden Paper, the color combo is so pretty. Of course I love the butterfly. Great hop, and I love your grouping Kerri, especially the floral ones. It's amazing how just a color shift can change the card tone. Beautiful. 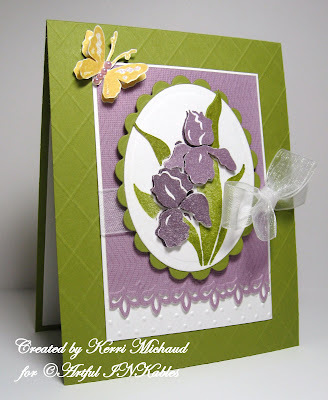 What awesome new sets and wonderful cards made with them, Kerri! Thanks for the chance to win! Kerri all your cards are just fabulous, as are the new sets! I'm especially in love with the Iris set! You did some amazing cards with that!!! Thanks for the chance to win!! !